Allt Maen in Lowick Bridge sleeps 2 people. Allt Maen can be found in the glorious landscape of the Lake District National Park, and ideally located for enjoying water sports or fell walking and climbing, these two spacious and comfortable properties (refs E3266, E3829 [Wetherlam]) have been created from the conversion of an 18th century barn. Allt Maen, its name derived from the Celtic ‘Old Man of Coniston’, a mountain visible from the properties, is on the first floor and Wetherlam occupies the ground floor. Coniston Water is just 2 miles, Windermere 8 miles, Blawith Fells are a short drive and Grizedale Forest tracks invite mountain bikers, whilst nearby stately homes and gardens offer more sedate pleasures. Shops are 3 miles away and a friendly pub (dogs welcome) is a short stroll. Allt Maen has stairs to the entrance. With Allt Maen all on the first floor: Living room. Kitchen with dining area. 1 double bedroom with beams. Bathroom with beams, shower over bath and toilet. Separate toilet. Wood burner in living room (small charge per basket). No smoking. Holidays run from Friday to Friday. Night Storage Heating, electric, bed linen and towels included. Cot. High-chair. Digital TV. DVD. Stereo/CD. Microwave. Washing machine. Wi-Fi is provided at Allt Maen. Shared courtyard garden and furniture. Bar-be-que. Parking. For a better idea of where Allt Maen is, you can see Allt Maen on the map below. Allt Maen is in Cumbria; should you be on the lookout for a special offer, you can find all the special offers in Cumbria. It's always worth checking to see what is on offer at the moment. 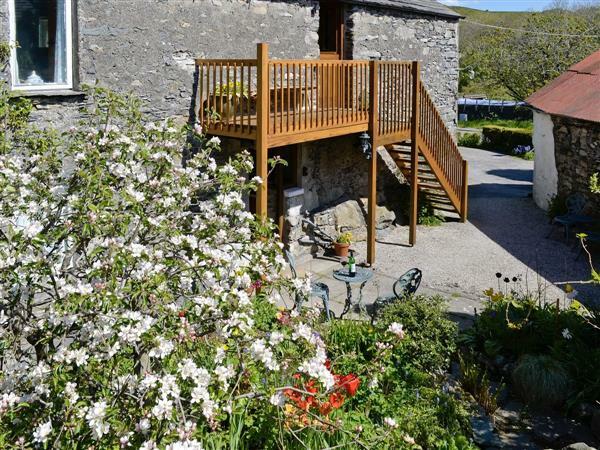 Do you want to holiday near Allt Maen (E3266), you can see other cottages within 25 miles of Allt Maen; have a look to find your perfect holiday location.